Ousia offers validated parking with our neighboring parking garage for $12. Street parking is also available. 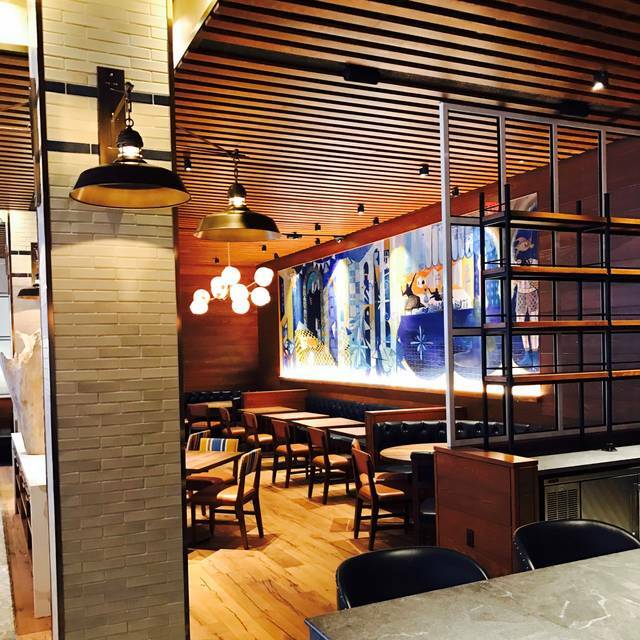 Ousia, a Greek-focused Mediterranean concept from the family-owned and operated Livanos Restaurant Group, brings an intimate shared dining experience to Manhattan for lunch, dinner, and weekend brunch. Celebrating the rich traditions of Mediterranean cuisine in the form of shareable plates, Executive Chef Carlos Carreto crafts memorable meals packed with beloved Greek flavors. Our comforting interpretations of classic recipes arrive at the table in a format that encourages communal dining among friends and family. Director of Operations Kamal Kouiri, who oversees the wine program, complements the chef’s creations with a similarly Greek-centric Mediterranean list accompanied by a selection of innovative cocktails and craft beers. The restaurant is lovely. The manager is so friendly and that is also seen in his staff. The food is healthy, delicious & beautifully presented. The cocktails are innovative and the bartenders are knowledgeable and engaging. I also love that there is space between tables. It’s a great place for any occasion. 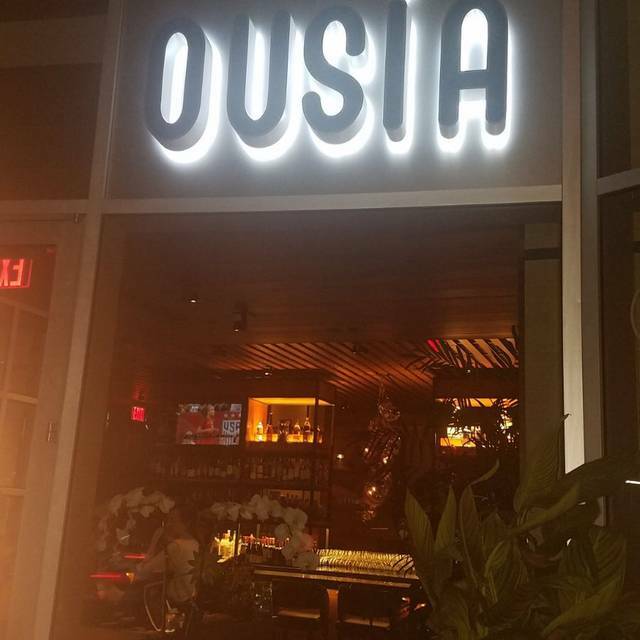 First time at Ousia and I had the best time. Our server was attentive and the food was out in a timely manner. I felt the quality was worth the price (which wasn't bad anyway). Best taramasalata I ve had anywhere. Eggplant spread very good. The whole eggplant on the other hand was extremely small and was drowned in salad, wasn’t appealing and could ve been better. Good Shepard salad. And that’s all we had. The food is great. Mani course portion of sea bass was small. That was really our only complaint. We left a little hungry. Food was to die for, service was absolutely amazing. Everyone was attentive, and they sat us in a section where we could be to ourselves. dishes are great to share. We'll be back! This restaurant doesn't know what it wants to be. I've been to Greece and other places in the Med many times- not difficult if you live in Europe, and am a foodie but this food was nothing like I have ever seen or eaten before. 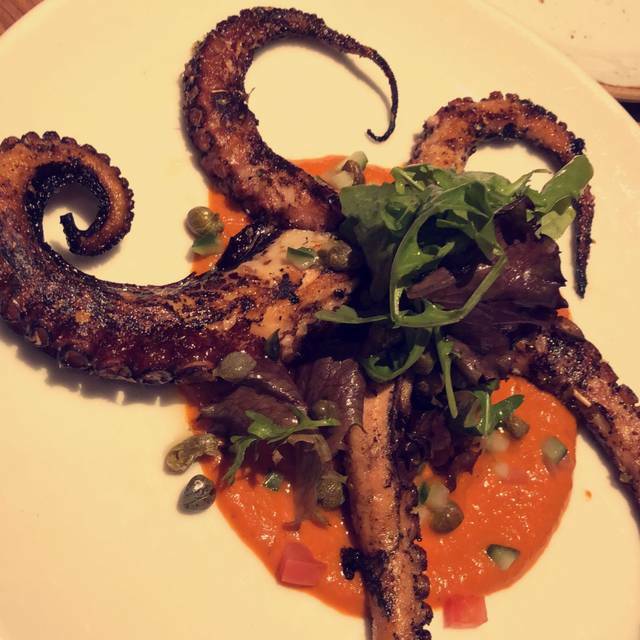 Grilled octopus on mash? Meat balls like burgers? Baklava too large and stolid to eat? Bt that's America for you. And no Greek or Turkish coffee because they had no-one on the staff that knows how to make it? A little research would have gone a long way. But great service so thank you for that. The wait staff was attentive, patient and very helpful. We could not figure out the wine list and she recommended a very good reasonable wine. She fully described all the items we asked about. We chose the lamb steamed buns, but there was too much bun and we probably should have gotten the lamb chops instead. The traditional Greek pies were OK, but the scallops and the baklava were outstanding ! Lovely, spacious setting and decor. Beautifully presented, delicious food altho' some of the heirloom tomatoes in the Greek salad were 'mushy'. We were presented a fab feta platter as they were celebrating 'Feta' week. We over-ordered as everything sounded so good---just appetizers and medium mains and we had no room for dessert! 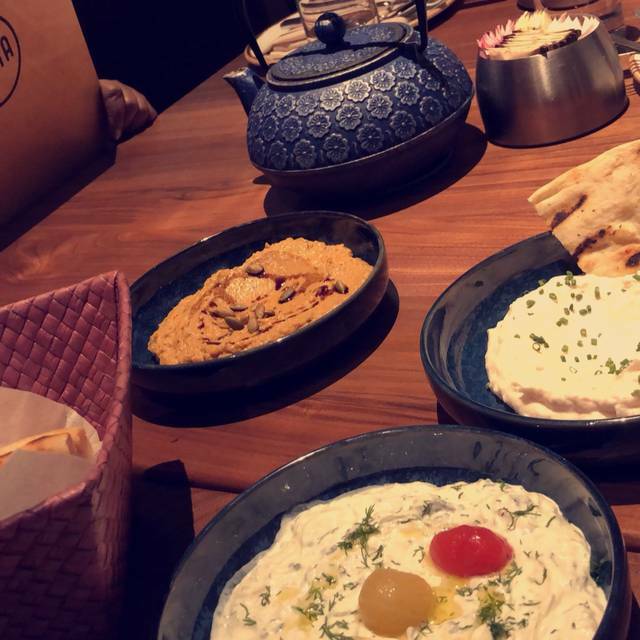 - 3 spreads with pita, Greek salad, mushroom flatbread, saganaki, chickpea falafel... all tasty and recommended. Perfect for vegetarians. Delicious food, reasonably priced. The waitress was very knowledgeable about the menu and it's preparation. Overall a delightful dining experience. Excellent food and interesting , multiple choices. The food was good. 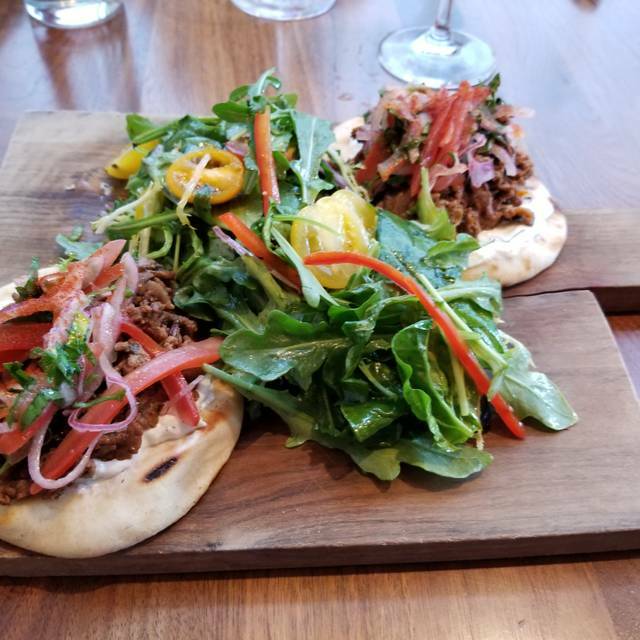 Some things were great (the spreads, the falafel) other things were ok (the octopus, Greek salad ). The service was poor. We ordered a bottle of wine and kept searching for the waitress to refill our glasses. We had a half a bottle left at the end of dinner because she never poured! So i bought a bottle that we didn’t drink. I had asked on open table, and asked the waitress personally to put a candle in dessert, it still wasn’t done. Dinner was good, not great. If you live close by, it’s a good spot. If you don’t, no reason to travel. We went for lunch and the restaurant was practically empty. Even though, the server took huge amounts of time to come over and give us a menu, serve our food and present the bill. The Caesar Salad consisted of 5 pieces of lettuce and the beet ravioli was completely tasteless. The worst meal I have had in years. Loved the food and had a great waiter. I only hope that next time I come the host will check where he is seating people because the voice of the woman next to me was so penetrating that I couldn’t concentrate in anything else. The restaurant is gorgeous. The staff extraordinarily friendly. The seating is very comfortable. And spacious. The food, however can go from great, to not that good. The first time I visited we ordered chicken and salmon dishes. The salmon was fantastic. The chicken tasteless. The next time we ordered a chicken and potato dish. The chicken was delicious. The potatoes, not that good. Then there’s the coffee. No Mediterranean the second time we are there. And also. no regular. We ordered Americano and it was very weak. Disappointed. 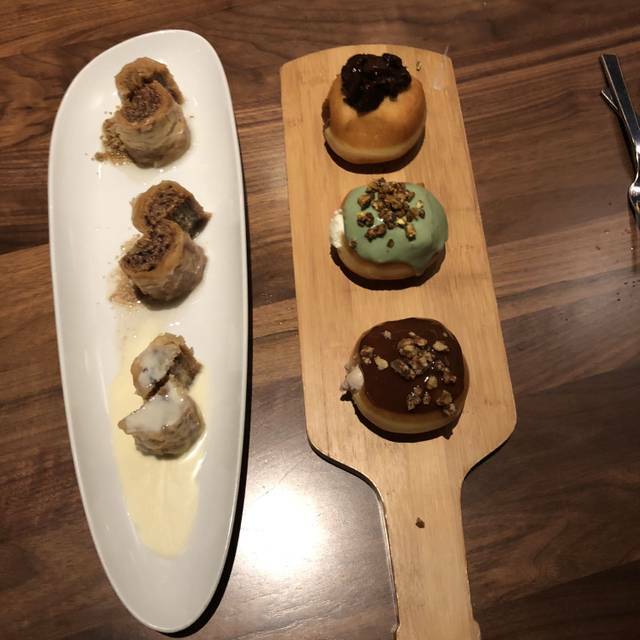 Both times the desserts were perfect. Overall, I do recommend this place. I figure that they will eventually get the foods and coffee right. As far as prices, it is the rip-off Manhattan norm-High. The grilled octopus was not grilled but soggy with no taste. The service was friendly but very slow, even to get a drink after we sat down. Maybe it is understaffed? 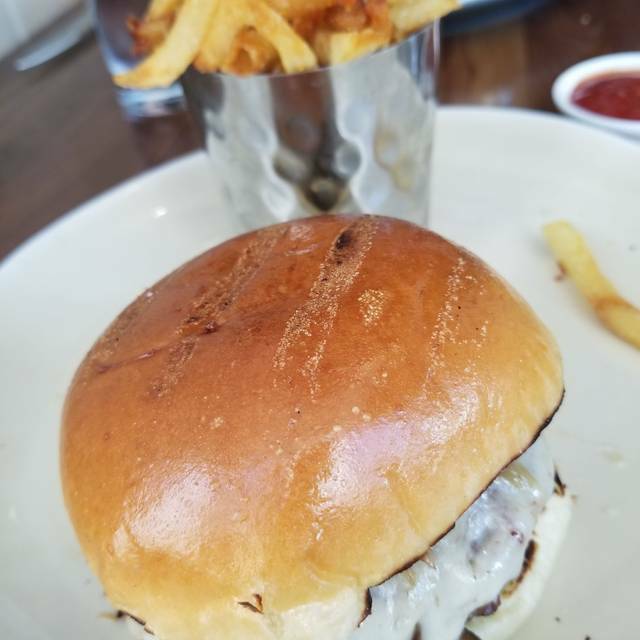 I have ordered in from Ousia multiple times because I live in the neighborhood and decided it was time to try to the restaurant as we had heard so many great things about how great they were with kids. Sadly, when we showed up on Saturday night (3/30), it was horribly hot in the restaurant, we were seated by the kitchen (which made our seats even hotter!!) and the service was very slow. Unfortunately, it looks like we'll just have to stick to take out! Honestly speaking, I had a hard time eating my food because I was so hot and we didn't even want to stay for dessert because we were so uncomfortable. Hope other people had a better experience than we did. Water refills were a bit sparse. Food was excellent. Fish special with bok choy was delicious. The spreads as appetizers were enjoyed by all. They missed the birthday hint. Fantastic hospitality and excellent food. Easily one of my best dining experiences in NYC. Genuine pride in what they do. Thank you! Wonderful atmosphere and service. Great food but a bit pricey. High quality food. Excellent service. Had a wonderful dinner at Ousia! Everything was great. Food, service, ambience all were fabulous. Looking forward to going again some day whe we get back to NYC. I have been to Ousia many times. The food is always delicious. Very consistent. I have never had a bad meal there. Service good. Place is very pretty. Large space with plenty of room between tables. You can really have a conversation there and hear each other which I find a real plus in today’s dining venues. My favorite restaurant- the food is always delicious and the service is excellent. Had the beet ravioli (my favorite) and the cauliflower falafel (also great). Highly recommend. Our waiter was wonderful--from Athens and with good recommendations on the menu. They were featuring a Greek wine, an Assyrtiko (if I'm spelling that right) and it was excellent. My meal was also excellent--highly recommend the appetizer--Edamame and Pistachio spread--and the lamb chops. My friend had the scallops and liked those as well. Fab Greek upscale restaurant. Wrap around bar where somehow you can always find two seats. And although the space is big, tables are clustered in little niches that feel intimate and not loud. The food is refined, inventive, authentic and delicious! Can't wait to go back. 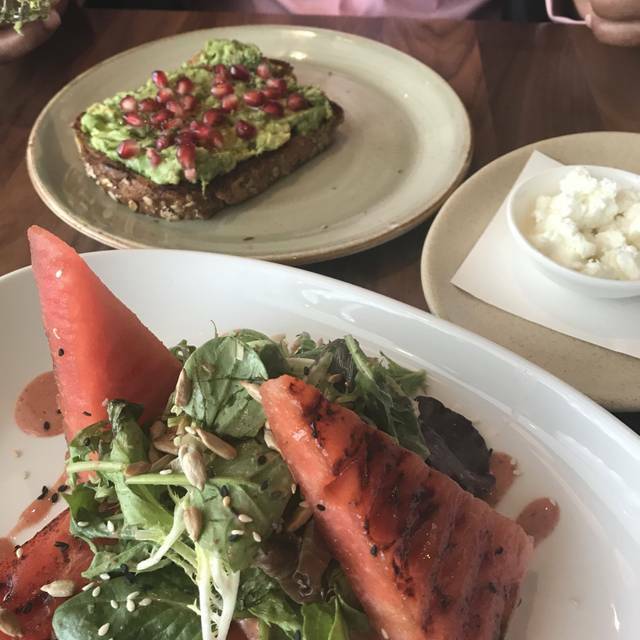 Ousia has delicious food in an upbeat, comfortable and buzzy environment. The service is a bit casual in contrast to the prices, which are upscale. However, the menu is excellent. scallops as a main course was tiny. scallops smaller than a dime. Great! We shared lamb shank special which was delicious. The cauliflower falafel was forgettable. Would go back! Walking distance from The Armory Show. 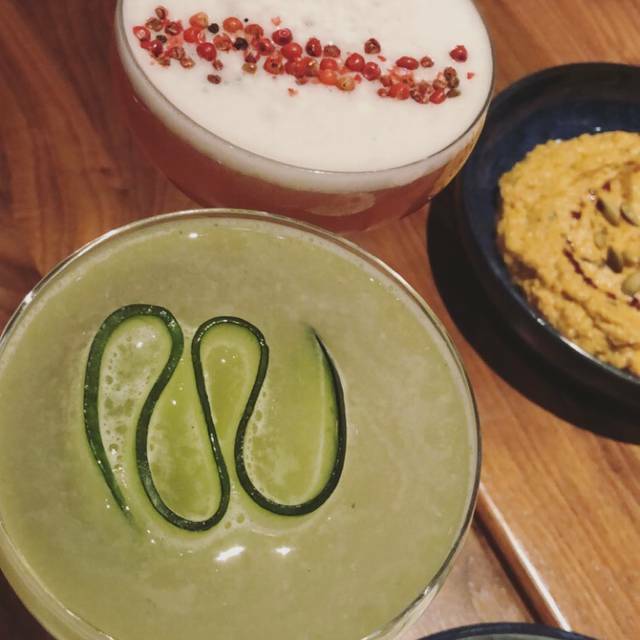 Great food, innovative cocktail list, terrific service. 10/10 will definitely be back. Excellent food. Excellent service. Expensive but excellent drinks. We had a delightful early dinner between Armory Art Show and event at Lincoln Center. Well located. Will return on next visit to NYC. Incredible service, gourmet Greek specialties and beautiful presentation. I am continually impressed by this restaurant. the service is great...food tasty.